Based on the Chinese calendar, the Year of the Tiger begins on 4 Feb 2010 at 6:42am. The Tiger is the third out of twelve animals according to the Chinese Animal Zodiac signs. However, based on the Julian calendar, Chinese New Year is celebrated on 14 Feb 2010 and this is the date for which most people would associate with the dawn of the Year of the Tiger. 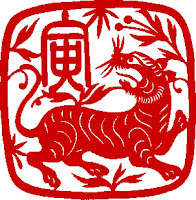 On the Chinese elemental sign format, 2010 will be the Year of the Metal Tiger. According to fengshui masters' predictions, drama, intensity, change and travel will be the keywords for 2010. Unfortunately, world conflicts and disasters tend to feature during Tiger years also, so it won’t be a dull 12 months for anyone. The Year of the Tiger will bring far reaching changes for everyone. New inventions and incredible technological advances have a good chance of occurring. For all of the Chinese horoscope signs, this year is one to be active – seizing opportunities and making the most of our personal and very individual talents. Everything happens quickly and dramatically in a Tiger year – blink and you could miss an important chance of a lifetime! 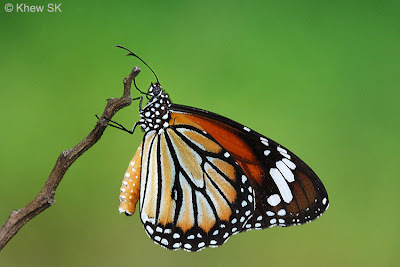 So it is not unexpected that we feature one of our butterfly Tigers as this month's Butterfly of the Month - The Common Tiger (Danaus genutia genutia). 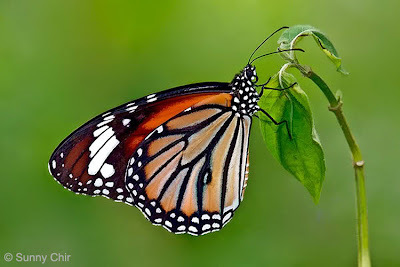 The Common Tiger has deep orange forewings and hindwings, with the veins strongly marked with black. 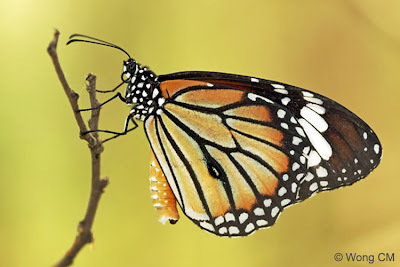 There are rows of white submarginal spots on both wings and a series of larger elongated sub-apical spots on the forewings. 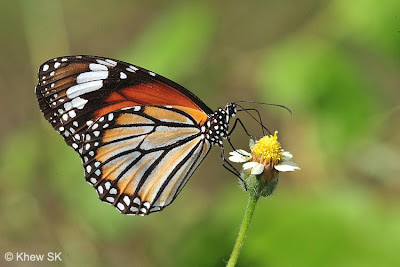 The apical area of the forewing is black on the upperside but ranges between dark orange to a greyish orange on the underside. There are two forms of the Common Tiger. The first is form-genutia where the hindwings are unicolourous with the forewings, but usually with a slight tinge of white along the black veins. 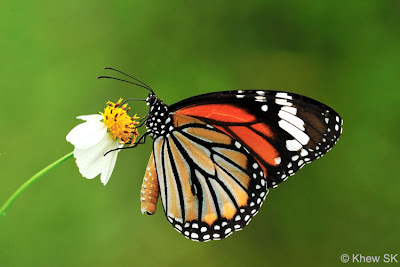 This form is usually the commoner of the two forms found in Singapore. 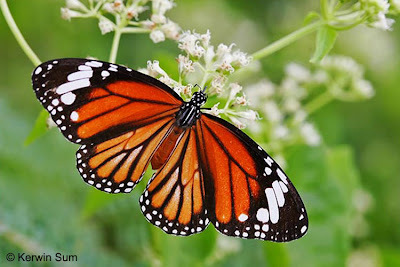 The white-hindwinged form, or form-intermedius has the hindwings coloured white, but usually with some tinge of orange along the wing veins and also along the submarginal border. 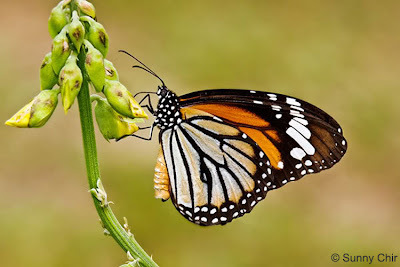 This form, which is rarer and less often seen can sometimes be mistaken for the Black Veined Tiger (Danaus melanippus hegesippus) when in flight. 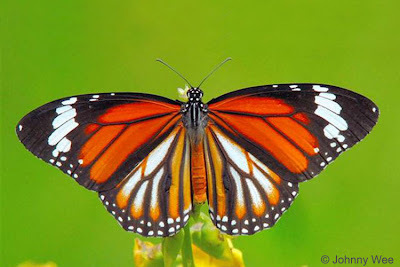 Males of the Common Tiger possess an oval brand containing scent scales on vein 2 of the hindwing. This is usually very obvious and can easily differentiate males from females of the species. The Common Tiger is a member of the Danainae subfamily, usually called collectively as "Tigers and Crows" and which feature aposematic colouration. 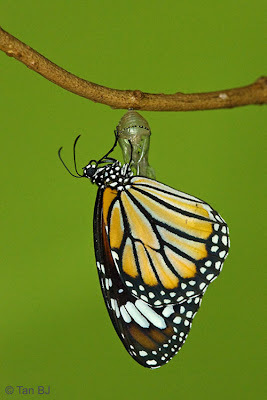 Due to their caterpillar host plants being predominantly lactiferous vines and shrubs, the majority of the species of this subfamily is unpalatable to predators. 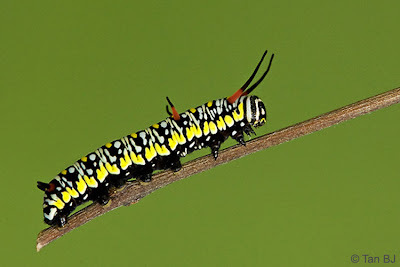 The caterpillar of the Common Tiger is black and banded with white and yellow spots along its body. The IInd thoracic segment has a pair of long black-tipped crimson filaments whilst there are shorter filaments on the 2nd and 8th abdominal segments. The host plant in Singapore has been identified as Cynanchum tunicatum a creeper weed that is found in secondary forests, mangrove/coastal areas and even on fences in urban areas. The widespread occurrence of the host plant may be due to the way the seeds are distributed by wind. 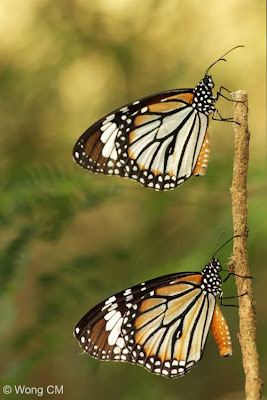 The Common Tiger is a common butterfly species in Singapore, and is one of several "Flying Tigers" that feature prominently in many of our butterfly-friendly parks and gardens. Where the host plant is aboundant, one can often see many individuals of this species flying around. The butterfly is partial to plants like Crotalaria spp. 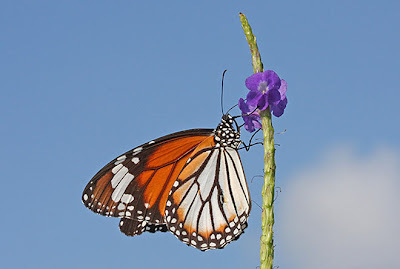 and the Indian Heliotrope (Heliotropium indicum), Adult butterflies are also fond of stopping and resting on twigs and vines in shaded areas after a morning of feeding. 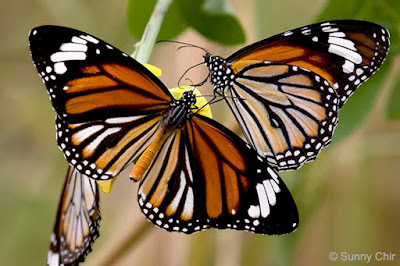 And as we herald the Year of the Tiger this coming weekend and enjoy the holidays over the Chinese New Year period, we hope that the Year of the Tiger will also bring new finds and discoveries for the Butterflies of Singapore! ButterflyCircle takes this opportunity to wish all our Chinese readers a "Happy and Properous Year of the Tiger" and "Gong Xi Fa Cai". This is a very informative blog. My class of 4 to 5 year olds are using this as a resource for their current project. Thanks, Chitra. Glad that your class of young kids are also benefitting from the information on this blog.